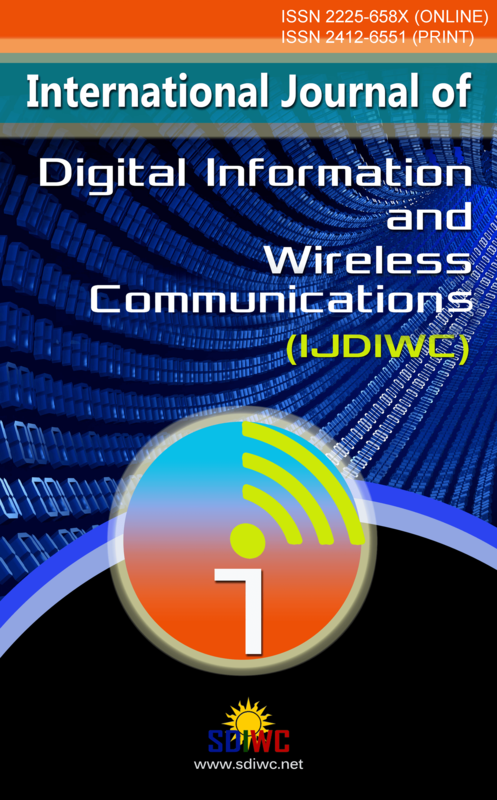 The SDIWC International Journal of Digital Information and Wireless Communications is a refereed online journal designed to address the networking community from both academia and industry, to discuss recent advances in the broad and quickly-evolving fields of computer and communication networks, technology futures, national policies and standards and to highlight key issues, identify trends, and develop visions for the digital information domain. In the field of Wireless communications; the topics include: Antenna systems and design, Channel Modeling and Propagation, Coding for Wireless Systems, Multiuser and Multiple Access Schemes, Optical Wireless Communications, Resource Allocation over Wireless Networks, Security, Authentication and Cryptography for Wireless Networks, Signal Processing Techniques and Tools, Software and Cognitive Radio, Wireless Traffic and Routing Ad-hoc networks, and Wireless system architectures and applications. As one of the most important aims of this journal is to increase the usage and impact of knowledge as well as increasing the visibility and ease of use of scientific materials, IJDIWC does NOT CHARGE authors for any publication fee for online publishing of their materials in the journal and does NOT CHARGE readers or their institutions for accessing to the published materials. As such, IJDIWC reserves the right to select only best submitted papers for publication. All submitted papers would be reviewed by at least two reviewers and one member of editorial committee. Please refer to Authors Guidelines for details of reviewing process and to submit your papers please refer to Submit a Manuscript. IJDIWC is an open access journal which means that all content is freely available without charge to the user or his/her institution. Users are allowed to read, download, copy, distribute, print, search, or link to the full texts of the articles in this journal without asking prior permission from the publisher or the author. This is in accordance with the BOAI definition of open access. 1- All submitted papers should follow our Code of Ethics! Plagiarism is a serious academic offense and will not be tolerated in any sort! Any case of plagiarism would lead to life-time abundance of all authors for publishing in any of our journals or conferences. 2- The authors of papers retain the rights to any intellectual property developed by the author and included in the manuscript including, without limitation, any models, theories, or conclusions formulated by the author.